Celebrate with a congratulatory speech. Engagement party speeches can add a very personal touch to a wonderful occasion, but there are many aspects to consider. One of the great things about planning an engagement party is that there are no hard and fast rules to follow. Unlike weddings, which are bathed in traditions and convention, engagements allow a couple to be much more creative in their planning. Therefore if a couple wishes to celebrate their engagement with a few friends having a quiet meal or by throwing the largest party possible, the choice is entirely personal. A couple can come up with their own answer to the question what is an engagement party. Why Have Engagement Party Speeches? Even at the most low key of parties it will be necessary to say a few words - this might simply be to thank people for attending and sharing the special occasion. At more formal occasions the engagement party etiquette might demand more structured speeches where the engaged couple, family, or friends share a few words and perhaps amusing memories and also thank people for engagement gifts and cards received. The best type of speech is always fitted to the occasion. A very informal party, such as a barbecue, is not the type of occasion for long formal speeches. 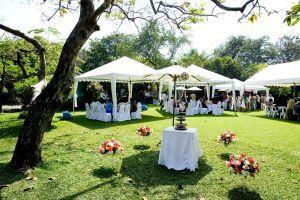 People are much more likely to want to join in the fun of outdoor cooking rather than listen to lengthy speeches. At formal occasions, however, structured speeches are much more acceptable. A few amusing words always go down well at parties. Whether these are amusing anecdotes about how a couple met or some childhood stories, they can be great fun. Families and friends will be a rich source of information. When making amusing engagement party speeches it is important to consider who the audience will be and who engagement party invitations might have gone to. It can be only too easy to shock older relatives or friends by making inappropriate jokes, and there may well be parts of someone's past that it is better to forget rather than risk upsetting people. Most people appreciate a few well chosen words rather than long, rambling anecdotes. When planning speeches or asking other people to make speeches try to put a time limit on things. The aim of the day is to celebrate with family and friends: speeches should be a part of this, but not overwhelmingly so. Even at such a joyous occasion as an engagement, there will often be slight tinges of sadness. Perhaps an illness in the family prevents important people from attending, or the loss of someone near and dear may trigger sad memories. Rather than try to ignore any sadness, it is important to bring it into a speech, perhaps with a toast to absent friends. At the same time, do not dwell on that sadness - this is a time to celebrate the couple's happiness. Informal engagement party speeches can be made by anyone, and when it is a case of simply saying a few quick words then no one is better placed than the couple themselves. For more formal speeches it is a good idea to consider confident and strong speakers who can engage the audience. The decision about who will make the speech will also largely be driven by the type of party chosen. If there is an engagement cake then just before the cutting of the cake would be an ideal time for speeches. Other good times are at points during the party that mark a transition such as the point before food is served or that engagement party favors are given. Another good time for speeches is before the dancing begins. It can sometimes be so easy to get swept up with the occasion of an engagement party that the impending wedding almost gets forgotten! It is important when planning engagement speeches that they do not overlap with the speeches that are going to be made at the wedding. This won't be an issue if different people are at the engagement party than are at the wedding, for instance perhaps just friends are at the engagement party and just family at the wedding, however this is something to consider. Even if no engagement party speeches are planned it is useful to have a few words prepared just in case the need arises. A 'spontaneous' speech may need to be made, for instance, of one of the guests proposes a toast to the couple. A few words prepared in advance means that there will be no embarrassing pauses in the celebrations. A few well chosen words can help make an engagement party a special occasion and one that will stay in people's memories for a long time to come.